Rudy has been named one of the best 25 sports movies of the previous 25 years in two polls by ESPN and ranked the 54th-most inspiring film of all time in the “AFI 100 Years” series. Based on a true story. Come see it with us! 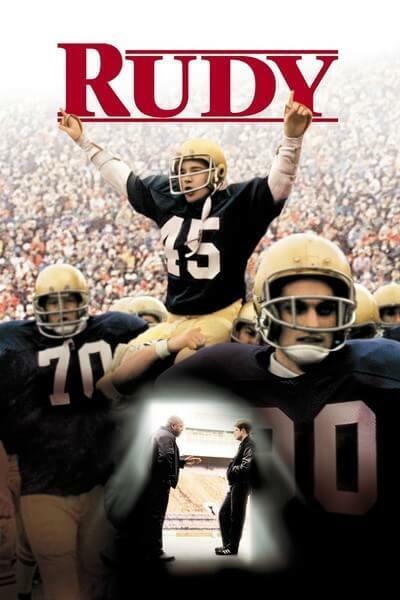 Rudy Ruettiger (Sean Astin) wants to play football at the University of Notre Dame, but has neither the money for tuition nor the grades to qualify for a scholarship. Rudy redoubles his efforts to get out of the steel mill where his father works when his best friend (Christopher Reed) dies in an accident there. Overcoming his dyslexia thanks to his friend and tutor, D-Bob (Jon Favreau), Rudy gains admission to Notre Dame and begins to fight his way onto the school’s fabled football team.